New Amazing Servos! - Our ZEUS & TITAN 14bit with updated firmware are available !!! - ZEUS 14bit offers 500ozin torque (X-metal Gear)! - TITAN 14bit offers 277ozin torque (Titanium Gear)! - *BRAND NEW* CRIUS 14bit offers 361ozin torque (Titanium&alluminum) Gear! Introducing a new way of mechatronics design ! 01TM Mechatronics is a company founded by engineers and robotics enthusiasts. Our extensive experience has been the driving force behind the design of our products. We aim at providing essential products and tools for the robotics engineer and enthusiast of the future. Our introductory product line includes a miniature motor controller, small enough to fit inside a standard RC-servo or on the back shaft of a DC brushed motor up to 24V/5Amps. Our product line will expand to offer solutions that are bound to change the way of mechatronics design. Order now the SMS V3.0. Subscribe to our newsletter and stay informed on new product releases , special offers and more! Python & Matlab & Arduino & Windows dll Libraries Now Available ! Our Python, Matlab, Arduino and WIN libraries are available for download. Explore the unmatched capabilities of the Supermodified controller through the use of the most widespread software & hardware! Arduino Libraries have been extensively developed!Teensy 3.6, Due ports are also developed, drop us a line to support you! Even a ROS node is ready at github! You can immediatelly integrate Supermodified Controller to your projects and enjoy a robust controller that offers among other functionalities position & velocity profiles! See the available downloads in our Support section! Thanks to our early adopters the first produced batch of SMS V3 has being sold out. We have given our best efforts to optimise our production and increase the numbers of our newly produced batches. Our technology is a new philosophy on how to built FAST and FLEXIBLE controllers EASY to Integrate to your robotics projects making your life easier! In order to fulfil this commitment we managed to offer you amazing new prices. 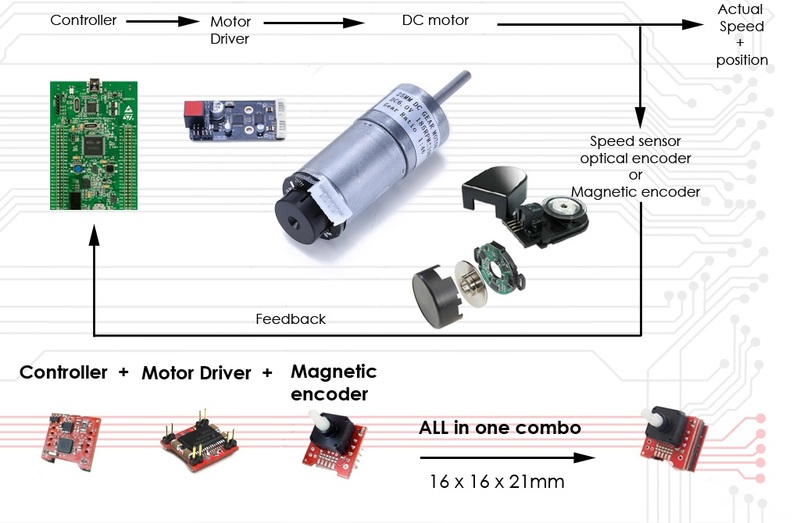 Solidifying our position into the market we provide PID velocity / position control with a 15-bit absolute magnetic encoder over a continuous 360˚ range for DC brushed motors up to 24V @ 5Amps. See in our YouTube channel which are the capabilities of our technology and what we are planning to offer you in the future altering the way the mechatronics projects are developed.